Our first lunch on Kauai was at Koloa Fish Market. 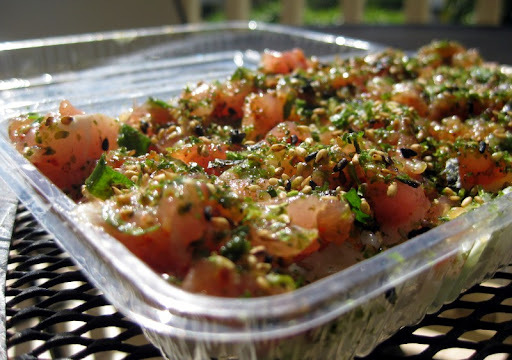 Located near the end of the little downtown strip in Koloa, this tiny shop serves up plate lunches and poke. They have no seating - just a wee bit of space in front of their counter where you can order your food to go. 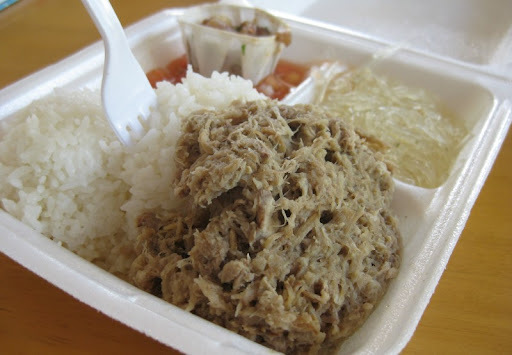 Their two standard plate lunches are Lau Lau and Kalua Pork. We got one of each. 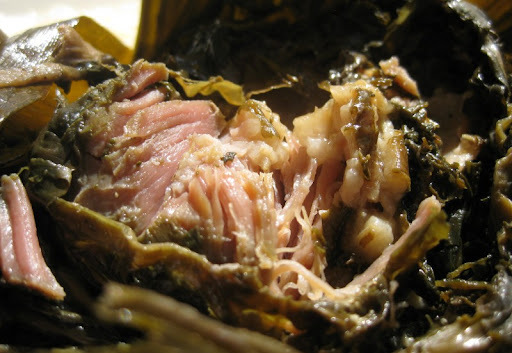 Lau Lau is pork wrapped in taro leaf, and then wrapped again in ti leaf. The pork was lightly seasoned, with most of the flavoring coming from the taro leaf. Subtle, but tasty. The Kalua Pork was less photogenic, but super flavorful with a nice balance of salt and sweet. Both plate lunches came with rice, Lomi Salmon, Ahi Poke and some sort of transparent noodles. The poke was our first in Hawaii. It was good, but ended up being the weakest we had on our trip. Still, it made for a nice little side for the plate lunch. 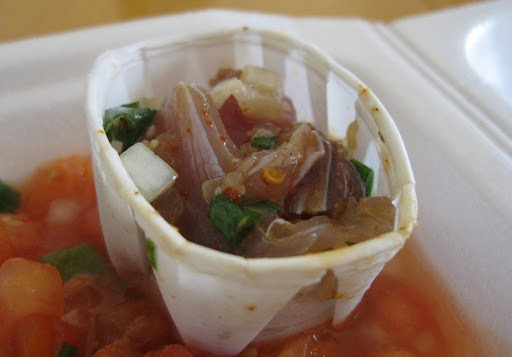 Lomi Salmon (which you can see underneath the cup of poke) is kind of like a salmon salsa. I find it slightly strange that it is a Hawaiian standard, since salmon isn't a local fish and tomatoes (good ones, at least) are pretty hard to come by. It was good, though. One of our friends got the Poke Bento - poke on top of rice with a creamy wasabi sauce. We didn't try it, but he enjoyed it. The flavor was nice, but I found it overly tough and chewy. 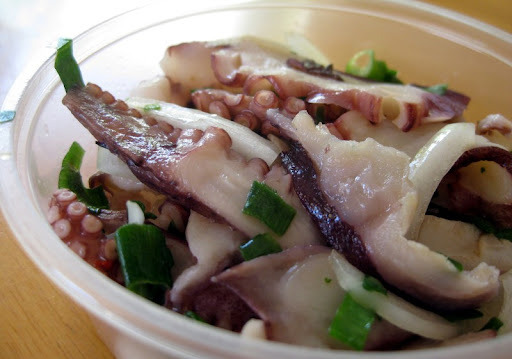 The other Tako Poke we tried later in our trip (at Ono Seafood in Honolulu) suffered from the same problem - maybe this is just how it is supposed to be? 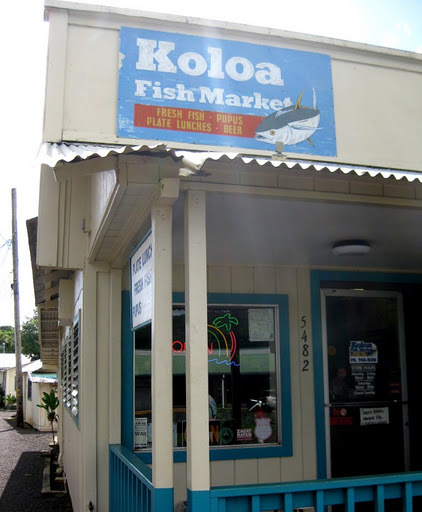 Koloa Fish Market is a great place to grab lunch if you are in the area. Solid portions of good food at reasonable prices (particularly for Kauai). It's too bad about the tako, but I could definitely go for that Poke Bento. I look forward to reading more about your vacation! Hi Alyssa - yeah, I'm not sure if I just don't like tako poke, or if I just haven't had a good one yet. I suspect the latter. Same here, that poke bento looks great! Thanks for sharing as always. 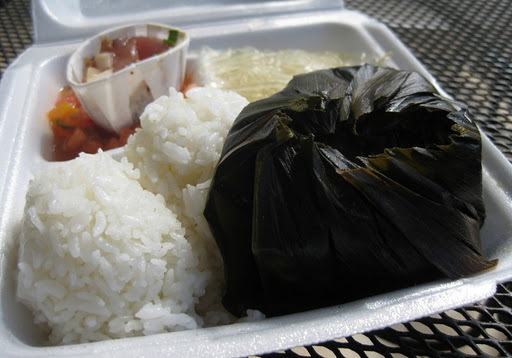 Hi Mike - Did the lau lau have salted fish(usually butterfish) in it? That's pretty much a required item. Also, did you chili pepper water? It also really makes the lau lau "sing"? The deli-style tako poke I've had all had varying degrees of toughness. I wonder if it has anything to do with sitting in acidic liquid for a period of time. 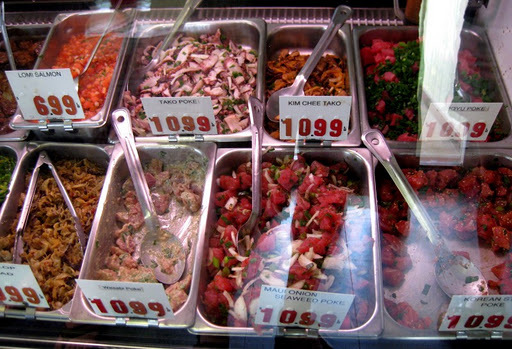 I like that those plate lunches had lomi lomi salmon and ahi poke. Don't see too much of that. I'm going to guess that the vermicelli noodles is a take on chicken long rice without all the garnishes and chicken. Hi Dennis - thanks for stopping by! Hi Mike - I forgot to mention this earlier. The history of Lomi Salmon lies in the legacy of whalers and the vessels from New England and the Pacific Northwest who brought with them salt salmon and bacalao (still quite popular with certain folks in Hawaii). Hawaiian had always used salt as a way of preserving fish and salt salmon and bacaloa just was a perfect fit, as well as the prestige of using Western products at that time. Thanks for the background info, Kirk! That makes sense - kind of like people here buying bacalao because it is traditional, even though there is plenty of fresh local fish available.